Every year we have so many calendars that I seriously hate having to change them out. I have one in the boys room, the office, the kitchen, and the playroom. Last year, we didn’t put up a single calendar and by mid-year the boys were begging for a calendar because they couldn’t remember what was going on each day. I printed a calendar for them to put between their desks to help them keep track of their days. Why didn’t we do calendars last year? I tried to go completely digital which obviously left out one important thing—the boys have always had a calendar and I didn’t provide a digital version for them as I did with the rest of the house. So this year thanks to Neu Year, we’ll go back to wall calendars with a slight twist as we’ll be using a revolutionary approach to calendars. The Neu Year calendar is HUGE! 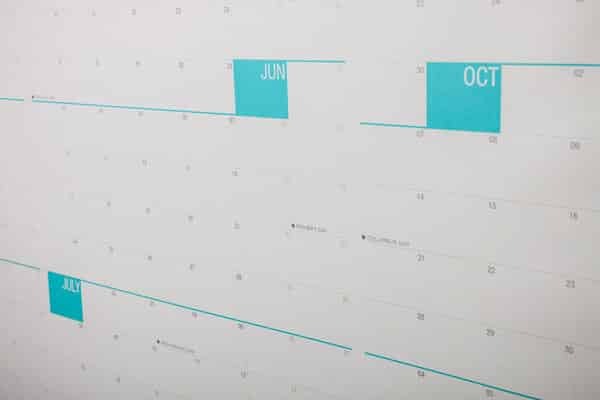 27″ x 39″ of pure calendar space. The color used doesn’t stand out nor fade into the background. Now it does take a little getting used to as the entire year is blended together but it makes more sense then traditional calendars. Next week, I plan to follow these fantastic tips for using a calendar and add some actionable items for our family. Maybe this year I won’t be scrambling to put together our family newsletter or forget to take our Christmas photos. Hop on over to Neu Year’s site and buy your calendar today and use the code below to save 30%. They offer standard or academic year in an uncoated or dry erase style. Neu Year has graciously offered to provide one lucky winner with a Neu Year calendar in their choice of dry erase or uncoated. We received the uncoated and while I can see the logic of dry erase, I like the idea of a permanent record of what we’ve accomplished this year. Disclosure: This post brought to you by Neu Year. Our family received product for free in exchange for an honest, unbiased review. Giveaway policy here. All opinions are 100% mine. I know I should put something about my blogging, but the truth is that I just missed seeing Cloud Atlas (movie) the ONE day it was shown in my city. I’m at that age where I need to see the calendar before me several times a day so I remember to do things! Isn’t that hilarious that we’d schedule time to schedule time. Why can’t the calendar just schedule itself?